Hold On. Most definitely hold on. 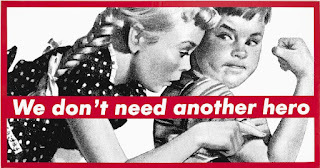 Now more then ever we need each other. We heard the beautiful/challenging poem earlier that Cici found and read. That work of art is a reminder to hold on to our past as a reminder of how far we have travelled on this long journey to get to where we are but also as a reminder for ourselves to hold on to the present, and our own faculty to act to affect our lives and the world around us. And just this realization that the choices we make affect change can help create hope. And we need both healing and hope now as a country. And that is what art can do for us and why art is so important as part of exploring religion. invites us to explore our inner life. Art communicates meaning to us beyond language. Art not only transforms us, but transforms our sense of the world, and even can lead us to transform the world. At the age of 31 while fighting against the Nazi’s he was captured, sent across Germany in a cattle car, and imprisoned in a camp. While he was there he found other prisoners who were musicians, and he wrote a composition called “Quartet for the End of Time” which is now one of his most renowned works. Paulnack in his speech says “Given what we have since learned about life in the….camps, why would anyone in their right mind waste time and energy writing or playing music? There was barely enough energy on a good day to find food and water, to avoid a beating, to stay warm, to escape torture - why would anyone bother with music? And yet - from the camps, we have poetry, we have music, we have visual art; it wasn't just this one fanatic, many, many people created art. Why? Well, in a place where people are only focused on survival, on the bare necessities, the obvious conclusion is that art must be, somehow, essential for life….. 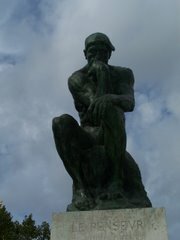 Both creating and observing Art, can help us make meaning out of life. A nice ending to that story is that the camp that Messiaen was in has become in 2014 a Centre for education and Culture for children and youth. 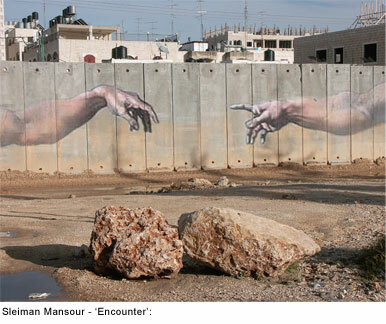 Lives and places transformed by art. 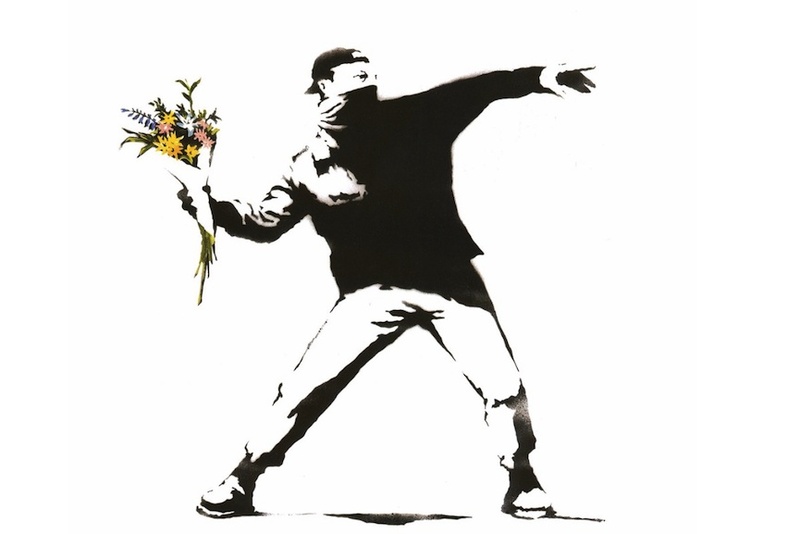 Art has the power to provoke and challenge us. It raises up in people their innermost emotions often. 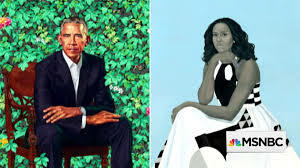 I think of the recent portraits of President Barack Obama and First Lady Michelle Obama. I was fascinated not only by the portraits, and not only by learning about the portraits, but also by the reaction to the portraits. Throughout the world, and even on my facebook page, there were unbelievable heated discussions about these portraits. If nothing else, that tells me they are great. It is true these portraits are not traditional portraits. That is what made them so fascinating to me. That is what drew my interest and my curiosity to them. If you are open to it, art can let you peer into another world, it can widen your world view, it can deepen your understanding of the world. This next piece is a famous work of art by Norman Rockwell called The Problem We All Live With published in Look magazine in 1964 depicting the scene of a young girl named Ruby Bridges who was the first African American student to desegregate Franz elementary school in Louisiana. 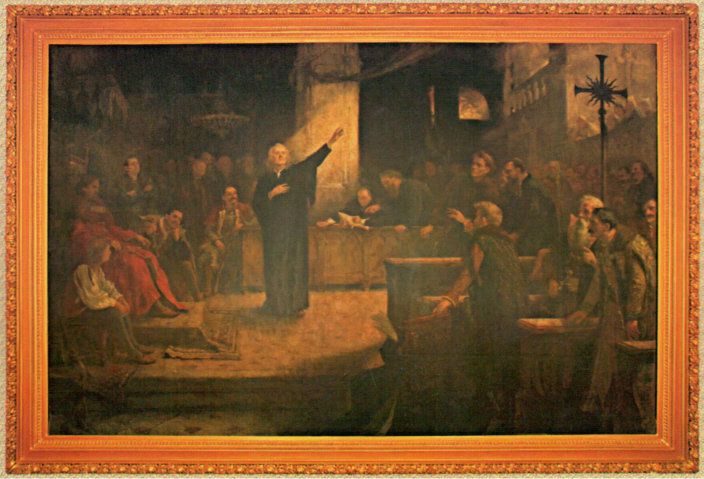 The painting was controversial at that time for many reasons. At the time, Rockwell had previously created only bucolic pictures of an idealic white America in the Saturday Evening Post, a conservative magazine. But due to their limiting what he could create, he moved to the more progressive Look magazine and this was the first work of art he did for Look, The fact that the artwork in a major magazine featured an African American in and of itself was controversial in those days. The title alone was also controversial. 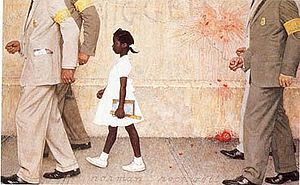 At the time, due to his background, some wondered whether Rockwell was saying the problem we lived with was Ruby Bridges, or Racism? We know looking back with more historical context about Rockwell he meant the problem was racism. Sometimes, it takes a while to appreciate or even understand art. But that is also the beauty of art in that it is often the outlier pushing the boundries of societal issues before society has reached them, and it can push us where we need to go. Our principles encourage spiritual growth in our congregations even when it is hard and we need to hold on and trust each other. 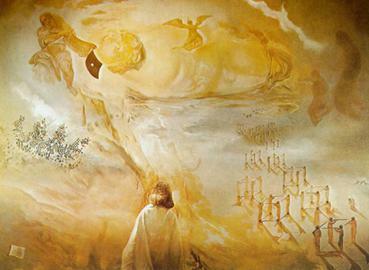 One picture that pushed me a bit in my younger days was the picture on your order of service by the Surrealist Salvador Dali. This painting hangs in the Dali Museum in St. Pete Florida. Crick upon realizing they what they had discovered is said to have walked into the nearby Pub and blurted out “we had found the secret of life.” Dali who was fascinated with science saw DNA as the proof of God’s existence which he tries to depict in this picture, while Crick is quoted as saying the discovery of DNA proved God didn’t exist. So similar facts, different conclusions. This art work fascinated me because it does raise the question of life and death and love and God. The very questions that shape how we view the world. On the left in the picture is the molecular strands of DNA, the very essence of what makes life possible. On the right is cube symbol for sodium chloride, a substance in our body that allows us to absorb nutrients. It is small here, but the cubes are painted as men pointing guns at each others head in a square, so theoretically if one shoots, they will all die. In the center of the picture between life and death is love in the form of his wife and muse Gala. Isnt that what we hope for between life and death. In the top left is the Hebrew prophet Isaiah, Whatever you might think of the Bible or its impact on the world, one cannot deny that is a powerful work of art that for those who find meaning in it, of which I count myself, it raises up the ineffable to the consciousness. And the prophetic Jewish voice is the Bible is twofold, on the one hand there is a warning against injustice and then secondly later after lamenting, there is a voice that speaks to a hope for the future. I feel that we are just stuck constantly warning against injustice, so let me today put the school shooting this past week in a different context for you. One of the core laws throughout the Hebrew Torah, was that it was an abomination to sacrifice their children, such as the Canonnites did to their God Molech. Not only was it an abomination to sacrifice their children but it was abomination to stand by and allow someone else to do that as well. So here we are the Sunday after yet another mass shooting of children and I have to ask myself, why have we allowed the sacrifice of children to gun violence. We have seen other countries take steps without eliminating gun ownership to eliminate mass shootings. But our God, the God that this country worships, the God that this country reveres above all else is Molech, the God of Death, We revere Guns, and we revere violence. more then we revere children. That in my opinion is an abomination and it is an abomination to stand by and let it happen without doing something about it. And congregants, I ask you, if you are a gun lover, please and I mean this sincerely, please come and talk with me sometime and tell me why you think any citizen needs automatic weapon in this country. I am genuinely curious to understand why people think that. Illustrator/multimedia artist Dolly Li created these pictures (PPT) during the Black Lives Matters Protest that sprung out of Ferguson. In creating this, she wrote, “One night I found myself standing face-to-face with Oakland riot cops, terrified and wondering about how much more terrifying this would be if I was a young black man, standing in front of a police line, demanding justice. But, Li goes on to ask, “is art enough? It’s romantic to believe that art can change the world, but the truth is, we still need so much more than that as a society.” The picture is hopeful in that it also depicts doves, which is the religious symbol for peace in many religions and cultures. Here are some additional works of art that have moved me over time.Barbara Kruger - from 1987 to challenge gender identities "We Dong Need Another Hero"
Art work from the Wall on the Israeli Palestinian Border. My favorite is Banksy work entitled Flower bomber found in Jerusalem after violence at a BGLQT parade. And I wanted to throw in a Unitarian one her, since it is the 450th anniversary of the Edict of Torda which ushered in Unitarianism as a formal named religion in 1568 where Frances David, famously said We do not need to think alike to love alike. Now you may say, Jay this is mostly political art, not religious. I will tell you religion informs our values, which informs our politics, and by politics I mean how we order ourselves and our society. Pushing our boundaries, deepening our understanding of the world and expanding our consciousness should always be part of our religious journey. I ask you to look at this picture. It is a painting of John the Baptist baptizing Jesus. You would say, this is religious art. 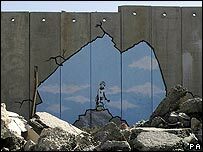 I would tell you it is a subversive political painting as well. 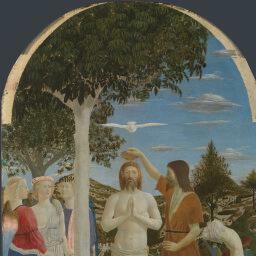 The story of John the Baptist from the Christian Scriptures is the story of a radical Hebrew who went to the desert to gather with people of conscience in the shadow of the Roman Empire and a complicit Hebrew King to claim that Hebrew Lives Matter and to Answer the call to love against oppression. And they created a ritual to commemorate their bond together. They envisioned a world that was different then the one in which they lived and then they went about working to create that world, willing to sacrifice whatever was necessary to make it happen. We too need the conviction, need the belief, need the vision of a world that is different then the one we live in. A vision where we don’t sacrifice our children so people can own automatic weapons. a vision really where we address the issues that make that youth troubled. So let us not give up on peace. Sometimes to get enough people over the tipping point it requires us to be jarred, to be provoked, to be challenged. Then it requires us us to jar, to provoke and to challenge. Let us challenge the notion that nothing can change. Let us challenge the notion that there aren’t responsible gun owners who want common sense change. this is an issue about the safety of children and if we do not act to change it, there will continue to be a reckoning on rich and poor, black and brown and white, liberal, conservative and independents. Bullets don’t discriminate. hold on to each other, hold on for as long and as hard as you can to create the future we dream about, in art, in our religion and in our lives. May it be so.